Hopi use of coal prehistoric times to today; environmental issues around modern day Black Mesa coal mine. Use of coal for fuel goes back centuries at Hopi. Modern mining which began in the 1960’s has created serious environmental issues. See article Coal Run for Hopi by Mary Boles, Hopi Thrival, about hauling coal for Hopi families. In a land with few trees for firewood, ancestral Hopis adapted to using coal dug by hand from natural seams in the Mesaverde sandstone which crops out in the cliffs on the edges of mesas. The simple technique of ancient mining consisted of removing the overburden and excavating the coal. The waste was piled behind the mining face. The result of mining was to leave an area stripped of coal and overlying rock, piled high with heaps of waste material. When the overburden became very thick the mine was abandoned, but in at least one area mining by underground methods was used. Archaeological remains show that Hopi ancestors in the Black Mesa area have used coal extensively during the 13th -17th centuries. “The Black Mesa region of Arizona, indigenous home of the Diné (Navajo) and Hopi peoples, is the location of the largest coal deposit in the United States, with approximately 21 billion tons of coal and a long-term value as high as $100 billion. Navajo Aquifer and salvage jobs upon the closing of the Black Mesa Coal Mine. As of January 1, 2006, one of the most contentious U.S. coal mining operations, the Black Mesa Mine on Hopi and Navajo reservations in northeastern Arizona, will close. This action is due in part to resolutions passed by the Navajo and Hopi Tribal Councils to prohibit the use of the Navajo Aquifer to transport coal and to the slated closing of the Mohave Generating Station for environmental violations. The use of the aquifer dates to the 1960s, when the Navajo and Hopi tribal governments entered into lease agreements with Peabody Western Coal Company (PWCC). The agreements permitted the extraction of local ground water and an average of 14 million tons of coal per year to provide electricity for southern California, Nevada, and central Arizona. The Mohave Generating Station, the facility that purchases Black Mesa coal, is scheduled for closure, having failed to install court-mandated pollution control improvements at a cost of $1 billion. Without a means to transport or a facility to receive their coal, the Peabody Western Coal Company will be forced to shut down the Black Mesa mine. This exercise of indigenous water rights and the preservation of the Navajo Aquifer seem to be a triumph for the sovereignty of native peoples and for the environmental community. However, immediate economic impacts cloud the victory—75 percent of the Hopi tribe’s annual income and about 40 percent of the Navajo tribal income is generated by the Black Mesa mining operations, which employ about 300 Navajo (Diné) and Hopi people. During its four decades of operation, the Black Mesa mine has been the epicenter of some of the most controversial debates around coal and water resource extraction on tribal lands. Residents, local grassroots organizations, as well as national environmental and social justice organizations, have called for the end of PWCC’s mining practices at Black Mesa from the start. Others have argued just as vehemently to protect the revenues and employment the mine generates for the reservations. Hopi, Diné, and other Native organizations as well as non-native groups have been working together to bring attention to the local, regional, and national concerns over mining Black Mesa’s water and coal. With the imminent closing of the mine, new threats to the environment compound the economic dilemmas facing the tribes. The time is ripe for the two tribes to transition to a sustainable economy that is more culturally relevant and environmentally sound. In 1965, with Tribal Council approval, PWCC began operating two coal strip mines on Black Mesa—the Kayenta and Black Mesa mines. Together these two mines make up one of the largest strip mining operations in the United States. The Black Mesa mine uses groundwater from the Navajo Aquifer to transport the coal 273 miles to the Mohave Generating Station (MGS) in southern Nevada in a process known as “slurry.” In this process, pulverized coal is mixed with water and then pushed through a pipeline. Currently, PWCC uses 4,600 acre-feet or 1.3 billion gallons of pristine ground water from the Navajo Aquifer every year for coal transportation. The Black Mesa mine coal slurry system is the only one in operation within the United States. Its use of groundwater raised local community concerns about the draw down and the sustainability of the Navajo Aquifer. This aquifer is the sole source of drinking water for the communities on and around Black Mesa. The National Institute of Science calls the Navajo Aquifer one of the most pristine water sources in the nation, and it is one of the few sources of drinking water in the United States that naturally meets the Environmental Protection Agency’s standards for drinking water. The Navajo Aquifer is showing signs of serious decline after decades of pumping by the PWCC, according to an October 2000 Natural Resources Defense Council report. Water levels have decreased more than 100 feet each year in some wells on Black Mesa since PWCC started pumping the water for slurry, the report says. In 2002, in response to heavy community opposition to PWCC’s use of ground water resources, the Navajo and Hopi Tribal Councils passed resolutions to end the use of Navajo Aquifer water for slurry transportation by December of 2005. In July 2004, PWCC submitted a revised application to the U.S. Office of Surface Mining (OSM) to extend the life and consolidate the Black Mesa and Kayenta mines into one permanent permit. The 2004 proposal would have expanded mining by 20 percent, extended the usage of the Navajo Aquifer, and make way for a coal-washing facility. As PWCC digs deeper for coal, the quality of the coal decreases; to meet generation standards, this coal must be washed to eliminate impurities. This coal-washing facility would require an additional 400-acre feet of water per year from the Navajo Aquifer in a closed cycle system. OSM began the federal regulatory process in 2004 to follow the National Environmental Policy Act for this new “Black Mesa Project.” The Draft Environmental Impact Statement is slated for early 2006. However, plans to process PWCC’s application are on hold as a result of the imminent closure of the Mohave Generating Station. Local residents are concerned about PWCC’s plans to expand mining operations. Their concerns range from the health effects of mining and burning of coal to the effect on employment and tribal revenues. There are concerns about how much the mining has already shifted a cultural and spiritual understanding with the earth. But one concern overarches all: the concern for the protection of the water. Both the Hopi and Navajo tribes have considered alternative methods to transport the coal, from rail lines to dry pipeline transportation. The least expensive way to transport coal is with water slurry, so locating a water source other than the Navajo Aquifer is the current focus of the tribal councils. Efforts have centered on tapping the Coconino Aquifer as an alternate water source for coal transport. To supply water for slurry, Southern California Edison (SCE) has proposed constructing a water pipeline running 120 miles from the Navajo Nation community in Leupp, Arizona to Black Mesa. The Coconino Aquifer is much larger than the Navajo Aquifer, running beneath most of Northeastern Arizona. It is a primary drinking water source for most of northern Arizona, including several Navajo and Hopi towns, as well as Flagstaff, Winslow, Holbrook, Joseph City, and the White Mountain Apache Nation. A recent feasibility study by the Bureau of Reclamation found that the Coconino Aquifer water supply would not suffer significantly if used for coal transport. Peabody Coal Company, SCE, Mohave Generation Station, and both Hopi and Navajo Nation governments are currently trying to secure this arrangement. This report and the proposal to use Coconino Aquifer water for slurry has alarmed residents of the towns of Leupp, Hopi, and Black Mesa. Their opposition to the proposed SCE pipeline and use of Coconino Aquifer is based on concerns about the decision-making process and unresolved accountability issues. The proposed pipeline would transport water for coal mining through the arid Navajo and Hopi reservations, where people often must drive many miles to haul water for their weekly uses. The affected communities, many without running water, believe that the use of water by the Peabody Western Coal Company should not have priority over the needs of people. Indeed, some Navajo and Hopi maintain that all water is sacred, and that no water should be used to transport coal. The scheduled closing of the Black Mesa mine has been met with mixed emotions. 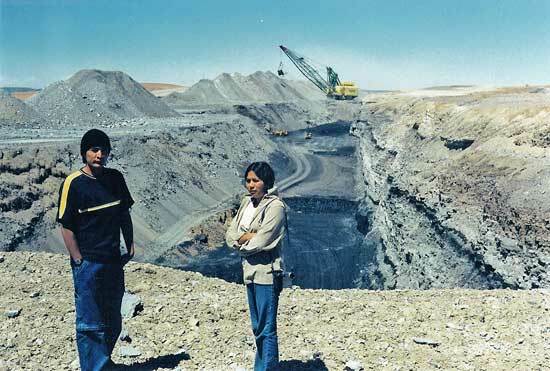 With a prospective major loss of revenue, the PWCC and the Navajo and Hopi tribal councils are exploring ways to keep the mine in operation. Possibilities include sending the coal to a different power plant or simply building a power plant on Black Mesa. In addition, the Hopi tribe has signed an agreement in principle with Oklahoma-based Headwaters Corporation to develop a coal liquefaction plant that converts coal into a form of diesel fuel. Despite these efforts, one thing is certain. With no leases renewed in 2005 and contracts unsigned, the Black Mesa mine and the coal slurry process will remain closed for at least five years. As the tribes face the challenges of protecting the aquifers and replenishing lost income, they also have the opportunity to make great and lasting transitions. For example, Black Mesa residents and local grassroots groups such as the Black Mesa Trust (Hopi), the Black Mesa Water Coalition (a Hopi and Navajo young people’s organization), and To Nivhoni Ani (Navajo) are working together to develop a vision and action plan for a sustainable economic future without the Black Mesa coal mine. They are joined by national groups such as the Sierra Club, Natural Resources Defense Council, the Grand Canyon Trust, and the Indigenous Environmental Network. Black Mesa Water Coalition photo: Roberto Nutlouis (left) and Lillian Hill at the Black Mesa Mine coal mine before it was closed. As a result of their efforts, town meetings for the Hopi and Navajo communities were held at the end of November to introduce the concept of a “Just Transition Plan.” Suggestions to finance such a plan, with job retraining, include a petition to the California Public Utilities Company (CPUC). The petition would request the California Public Utilities Company to grant tribal governments funds gained from the sale of the sulfur credits from the closed Mohave Generation Station, estimated at around $40 million. Any Just Transitions Plan for the future must reflect the interests of Black Mesa community members, including job retraining for former mineworkers. One scenario might be to develop solar and wind energy facilities in place of coal mining and power plants. For example, the Hopi tribe is part of the Sunshine Wind Farm, scheduled to be on line by 2007. Other sites on the Navajo and Hopi lands are currently being evaluated for their future wind and solar energy potential. It is clear that the exercise of indigenous water rights to protect the Navajo Aquifer has added to tribal economic and environmental dilemmas. The complexity of the issue challenges all stakeholders to come up with creative, positive solutions to protect groundwater for future generations. Enei Begaye is of the Diné (Navajo) and Tohono O’odham Nations and grew up on the Navajo reservation. She studied geological and environmental sciences with a focus in land and water management at Stanford University. She is a board member and co-founder of the Black Mesa Water Coalition, which works to build sustainable communities while empowering young people. She is also the co-founder of Native Movement, a nonprofit organization that encourages positive community reliationships. In addition, Enei is the water campaigner for the Indigenous Environmental Network (IEN), where she works with indigenous communities throughout the U.S. to protect their water resources. Black Mesa Trust was founded in 1999 by the Hopi people to address the severe environmental impact and destruction that Peabody Coal Company’s water withdrawals (from the Navajo Aquifer) were having on the environment, and the cultures of the Hopi and Diné (Navajo) people living on Black Mesa. Over 30 years of groundwater pumping by Peabody has weakened the water pressure and the aquifers, causing many of our springs and washes to dry up.